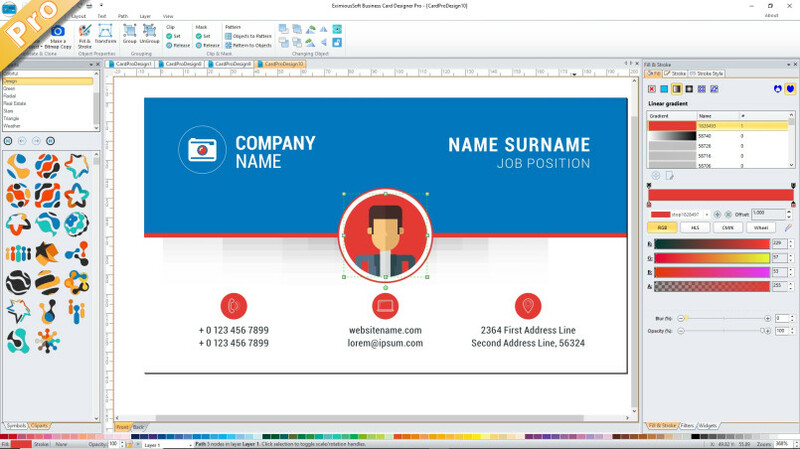 EximiousSoft Business Card Designer Pro is a great vector graphics design program with full featured tools for creating professional looking business cards. This application comes with 400+high quality business card templates, 5000+ pre-designed shapes and 500+ attractive clip-arts. You can use from the supplied material to start the layout of your card. The process of designing is based on inserting ready for use elements accessible in the program such as figures, images and the background, and freely shifting them on the prepared project. This Business Card Program lets create great business cards fast, fully customize them using a rich assortment of design tools. You can use pencil tool to draw freehand with simple paths, pen tool to create Bezier curves and straight lines. It provides a dozen shape creating tools create rectangles (may have rounded corners), ellipses (includes circles, arcs, segments), stars/polygons (can be rounded and/or randomized), spirals etc. The text tool is a highlight in the application. You can create or edit single even multi lines texts on full canvas via WYSIWYG environment. You can put a text on a path or in a shape while keep editing. The program has the most powerful vector tools for editing graphics. The text objects, shapes including strokes can be converted to paths easily. To paths, they can be edited by Node Tool: moving nodes and Bezier handles, node alignment and distribution, etc. All vector objects like shapes, texts, paths can be filled or stroked with solid color, gradient colors, pattern and images. Besides that, more than 50+ pre-designed filters which can be used while working on all above objects. Business Card Designer Pro 400 supports business card paper for ink jet and laser printers, from Avery, APLI, Hisago, Sigel, A-One ,Printec and other manufacturers. You can print them on your own printer or export your design as pdf or jpg files and bring to a professional printshop for printing.